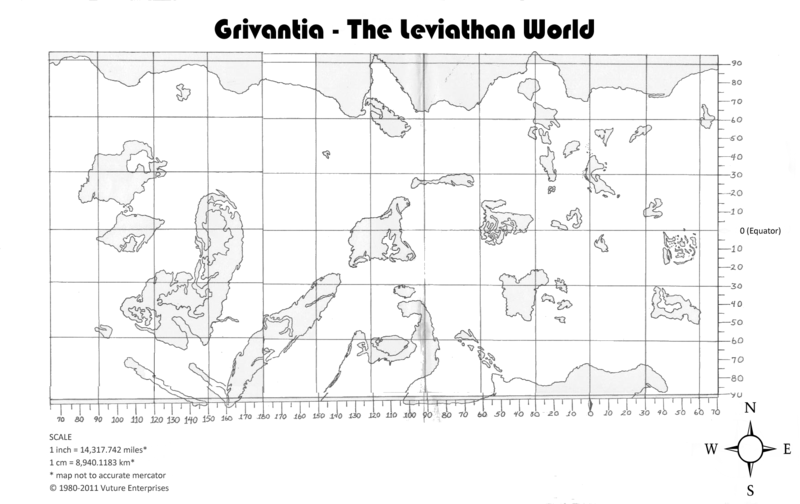 Grivantia, The Leviathan World | It is the year 2545 of what was once called the Common Era. Humanity's quest for the past six centuries has been to find signs of extraterrestrial intelligence. The Gaonz, an ancient civilization from the Leviathan World, Grivantia, find us. ~ It is the year 2545 of what was once called the Common Era. Humanity's quest for the past six centuries has been to find signs of extraterrestrial intelligence. The Gaonz, an ancient civilization from the Leviathan World, Grivantia, find us. The first volume of Part I (The Cradle’s Edge) of The Magellan Argosy Saga, a 9-volume series in the life of Merit Kostenurka, a 14-year old farm boy. His life is about to change forever. In fact, it is not just his life that changes, but the lives of all human beings everywhere throughout the Solar System. The book will be published and released in chapters on this site—one per month beginning January 2016. Book One is titled Terra Nova. Be the first to read this exciting new novel for free. This site will not only publish the book online but it will be a unique experience in novel reading. The book will be annotated with hyperlinks that link to resource material used for this book that take an in depth look at the cultures, languages, technologies, histories, characters and more. 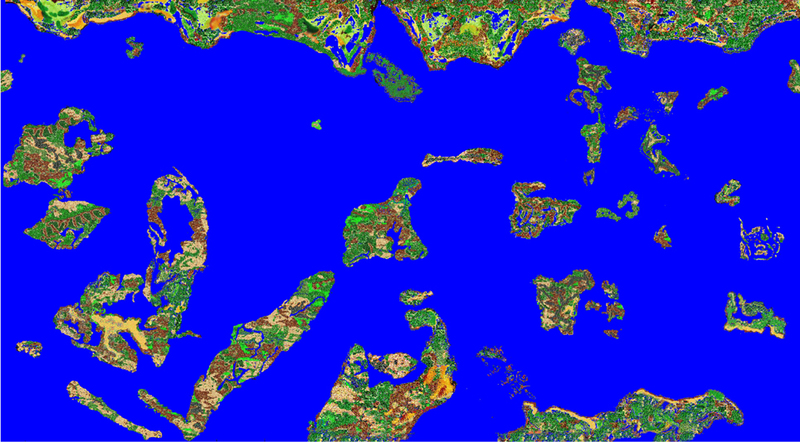 See detailed maps and images of the alien world of Grivantia. Learn the alphabet and language of the sapients who inhabit this strange and ancient leviathan world. Read biographies of your favorite characters. Explore their alien world for indigenous life forms. This is the story of Homo sapiens’ resiliency and tenacity. Is it fate and divine providence or technology and science that await us in the future? How do we reconcile science and religion? What will today’s progeny be like in 500 years? How will we survive when the present looks so bleak? We are the most adaptable creature to inhabit Earth and soon we will move beyond into our Solar System. What will we find there? How will we live? Once upon a time, long long ago…no, I’m not speaking metaphorically or in the fairy tale sense. It was a day in one of my classes in Junior High where I got bored and began to doodle. My friend, Mack, and I used to get together and imagine what we would do when we grew up. We both loved the sea even though we lived high in the mountains of northern Arizona. We dreamed of a future where we would live and work under the sea. 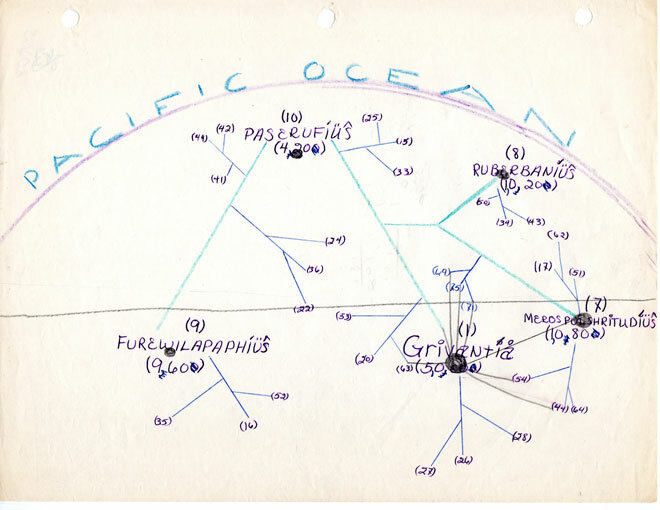 We were both into science fiction and crazy ‘B’ movies so, decades before Seaquest: DSV, we dreams of a network of submarine cities connected by a network of tubes along the ocean floor. In those days we knew nothing of the terrain under the oceans. That had not even been explored yet! But we went on with the ideas and fantasies until one day Mack broke the news that his mother was selling the business and they were moving to California. We were both crushed as were our grand plans. I never heard from Mack again. The idea, however, had lodged itself deep within my brain. I went on to study French and became enthralled with another language and culture. I found I had a facility for learning languages and went on to study German, then Spanish, Russian, American Sign Language for the Deaf, Esperanto, Navajo and many more. I still study languages. Currently I am learning Hindi. A couple of years ago, it was Dutch. Not long after Mack moved I had been exploring the wonderful world of codes and ciphers. 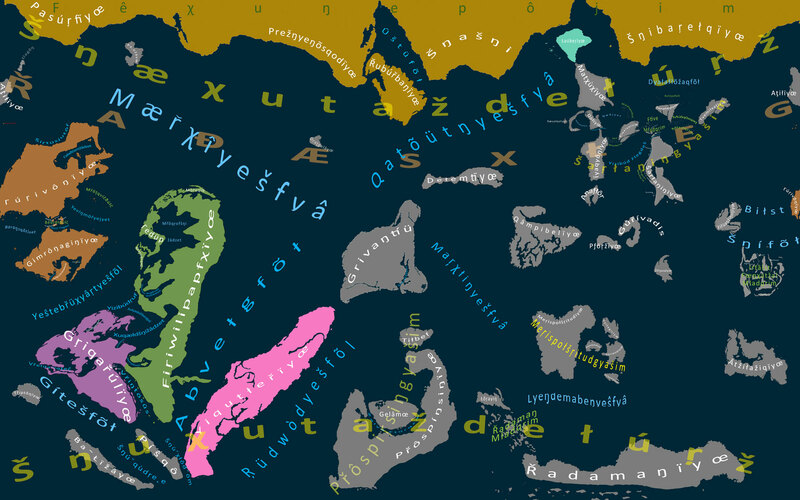 Then it hit me one day to create an alien language and put my under the sea cities on an alien world. Thus, Grivantia was born. It was 1965. 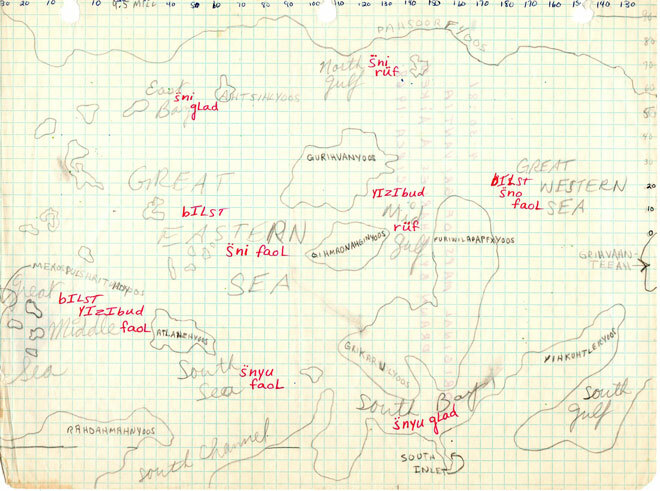 Today, almost 50 years later, the maps have evolved but the core essentials are still there. My goal from the beginning (in the days before personal computers and the Internet were science fiction) was to keep the details consistant. 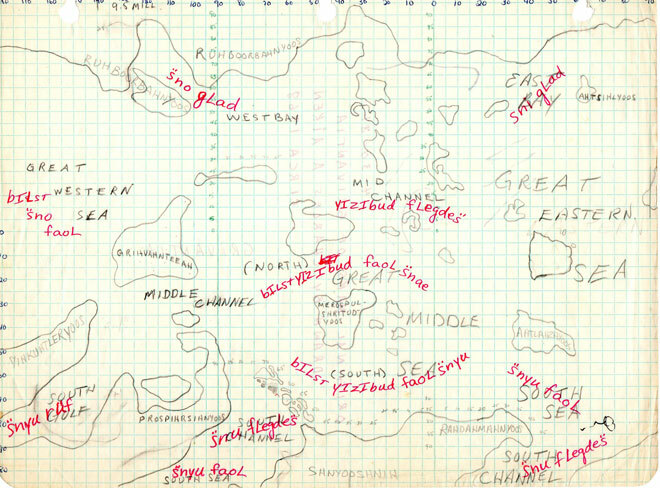 Names, positions, land masses and shapes. 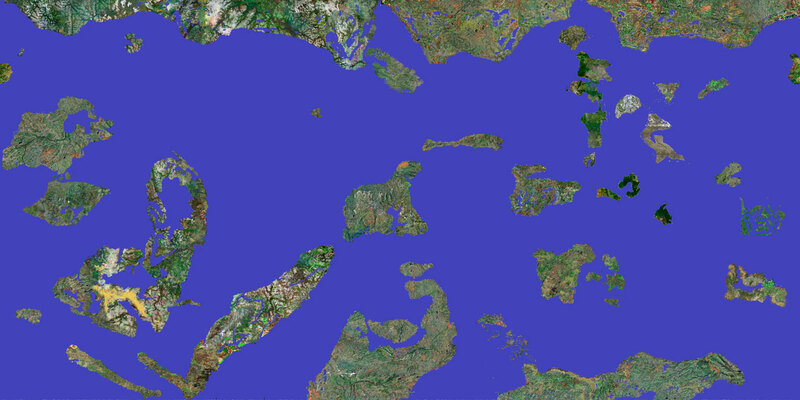 Not much has changed from the first true maps of the world I call Grivantia. All images and other materials on this site are ©1965-2015 Vuture Enterprises and Charles A. Aiken (aka AEM3) ALL RIGHTS RESERVED. The idea began in 1965 when I was doodling in one of my junior high school classes. 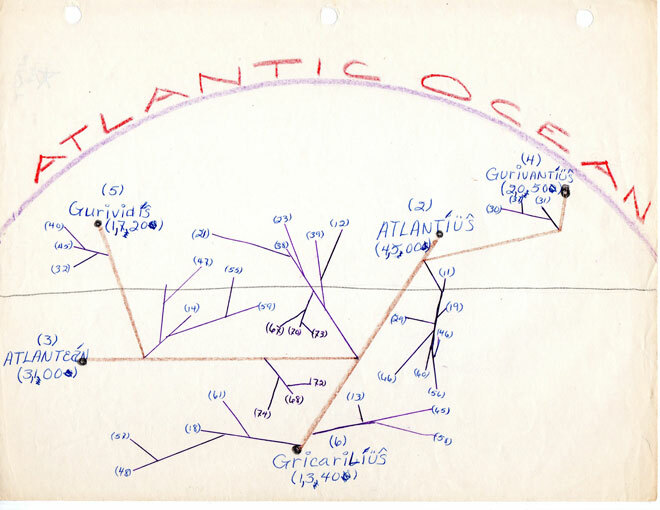 Nearly 50 years later, it has become an obsession of sorts with alien languages, alien worlds, maps, drawings and, of course, the well-charted beginnings of a 9-part novel. The first volume is nearing completion with the second coming together quickly. The other seven I fill in the details as I go along. This blog is to chart the progress, help me keep focused on the project and to share with the world my processes and goals. Hopefully others will find the stories I am making of interest enough to buy the book when it comes out but I am in it for the experience. If you enjoy what you see and read, please comment and give feedback. I invite anyone to get in on the creative process and the story. (Keeping in mind, of course, that certain details are already outlined to bring the story to its final and, what I think is, an amazing ending. Here you will find charts and graphs, maps and painting all relating to the book(s). Some of these are for sale so if something strikes your fancy and you would like to have a fine giclée print, these will be available on my art blog, The Lonely Eccentric or from postings through links throughout this blog. The novel takes place about 500 from the present time. It is a science fiction story that explores the challenges facing the first pioneers to live and work in space and then to undertake the first journey outside the solar system. It will also involve first contact with an alien civilization and the world from which they come. Mostly though, it will be a story of the human condition and how we continue to cope and struggle with the changing forces of time and our rapidly advancing technologies. How will things today look in five centuries? Will we solve things like over-population, food scarcity, climate change, living beyond Earth’s protective atmosphere, making first contact? What will these things look like a half a millennium from now? How will humans be different from now? The same? Will Earth still be the same? Ever have a dream that won’t go away? I’m not talking about a dream-while-you-sleep dream, but the kind you have that is a fond wish or desire. Something special and wonderful that is unique to you. It often takes the form of an obsession or a very strong desire motivated by something that is pressuring you in your life. Making you wonder, “Why am I here?” “What is my purpose/my reason for being?” It is the dream that only you can answer. It is often that dream that sparks in us a zest for life, a joie de vivre. The thing that makes us want to get out of bed in the morning because we are eager to return to that which gives us joy in living. Maybe you had this dream when you were very young and now you are getting older and beginning to wonder, “Why didn’t I do that when I had the chance!” Maybe it was a dream you had in school but now that you are working and have a family or your job is too busy for you take the time for that. That was the kind of dream that I had. It took the form of an obsession. I decided to take all the material I created through this dream and put it into a novel. I also wanted to document the struggle that I have gone though that brought me to this point. It began when I was very young. So young, in fact, that most people that age had not a clue what I was thinking or what I was aware of. My parents, naturally, were the first to notice. They just kept saying, “Oh, he’s different.” And I was. I did most things other children were doing…differently. I was much more affectionate and demonstrative to my family than many members of my family were. As I got older, the men became uncomfortable and the women thought I was so polite and smart and easy to get along with. I took great interest in everything around me. I can remember spending hours walking through fields or visiting farms to see all the wildlife. The bugs, for a young boy, were of particular interest. I liked stories and I liked to read but I had trouble with comprehension which, in those days, any form of dyslexia was unheard of let alone treated. It was at a time when this was suspected but not practiced or widely known. Still I struggled to get through it until I could read well but constantly regressed after a few sentences or a paragraph or two. Sometimes I’d get stuck in the endless loop for a quarter of an hour or more all the time asking myself, “why am I not getting it?” I rarely finished reading and writing assignments that were designed to review what I had read and summarize or make a commentary upon it. One day in high school I found a class. It was remedial reading. There was a great stigma upon others who needed remedial reading so I was not about to shame myself by admitting it to someone. Finally, I confessed to my English teacher. I was nearly in tears. I wanted so badly to read quickly and comprehensively like others I saw but could not. She told me something wonderful. She said I was not alone and that many others have the same problem. There are all kinds of reading problems, not just twisting words or letters around as is the common belief. That sent me on a quest. In Junior High I was a typical teenager who hated the way I looked. I thought I was ugly and that no one liked me. I was awkward and clumsy. I didn’t like sports–at all. I tried being a spectator but quickly got bored and could not then nor to this day understand the fascination others have with this. It makes no sense to me. I’d rather look through a telescope, walk through the mountains or deserts examining the terrain and the rocks or walk through a field in summer and try to identify as many flowers, plants, insects and animals as I could see. 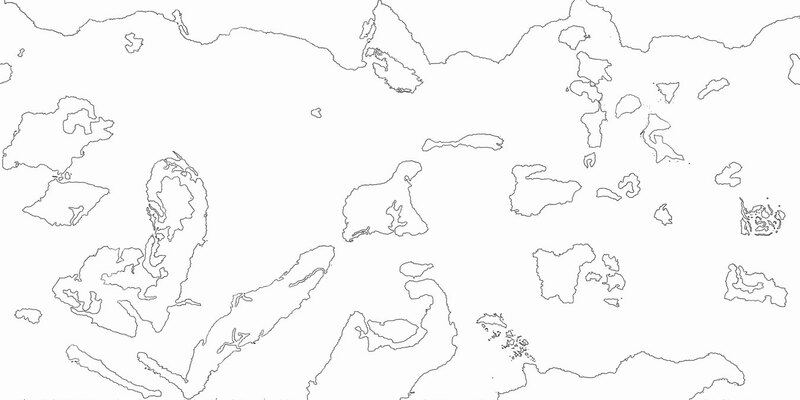 I liked drawing maps of places I had been. I thought long and hard about becoming an architect. I read much on the subject and even studied it for a while. Eventually, I found I had a natural gift for languages, so I began a study that has continued all my life. I began with French, then German and soon I was learning Spanish. In my senior year of high school I was awarded a special Certificate of Recognition for Excellence in French Studies. This award had never been given before. I was very honored. However, that same year I had elected to take French, German and Spanish simultaneously. The faculty denied it. Said no student can take more than two foreign languages at the same time. Actually, the study of French was boosting my English skills and the German helped my French a lot. I did eventually study Spanish and picked it up quickly as I already spoke French. The same was true when I studied Portuguese and Italian. Over the years, I have studied many more. Some, like Dutch, I would have liked to had delved into more deeply. But I never traveled abroad so the chances of meeting someone in the U.S.A. who was Dutch and could not speak English was remote at best. For many years it has been my custom to try to make friends with anyone I meet who does not speak English well. Because of this, I have learned not just the language but the culture of Navajo, Mandarin, Thai, Japanese, Swahili, Maltese, Basque, Polish, Russian, Arabic, Greek, Hindi, Oriya and many more. Knowing people from different walks of life through their language and culture has been a fascinating and wondrous journey. All this and more prepared me for another journey, a journey of literature and this has lead to the desire to put all this accumulation into a novel, a saga. This blog will is to chronicle that dream and to share it as I know there are many out their who struggle with many of the same problems and are stuck. Maybe this will help. Maybe it will help you to feel so not all alone as I did in that High School English class. Maybe it might motivate someone to follow their dream and make it come true. Maybe it might even help me to overcome my own fears and finish the novel and get it published. Might be. Far stranger things have happened. This is a nine-part saga that takes place in three stages. Each stage is a trilogy. The story takes place 450 years in the future as is about the life of a 14-year old boy who lives to be over 1200 years of age. In the end of his record-long life, he continues to wonder, “What is life all about?” Well, that’s putting it simply. Like life, it gets a lot more complicated and adventurous along the way. You can get into a lot of trouble over the course of twelve centuries. 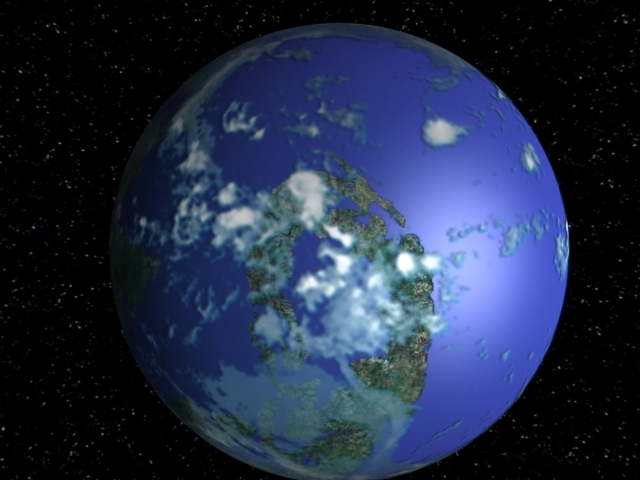 See how it all began in the first novel, Terra Nova. Coming soon!